Hollywood Celebrity Dog Trainers To The Rich And Famous! Hollywood trusts nobody more than K-9 Behavior Services when it comes to honest, straight forward, and reliable dog training information. When Hollywood needs the best in dog trainers, who do they call? K-9 Behavior Services’ is the ‘go to’ for Hollywood when it comes to the real facts about dog training, dog aggression, protection dogs, attack dogs, doggy boot camps, and all things dog training! Hollywood, for many dog owners, is the source of valuable dog training information and attack dog entertainment. Therefore, the Hollywood entertainment executives need to work with the best. K-9 Behavior Services’, Jeremy Talamantes, has a stellar reputation for being able to provide trained dogs that can perform under even the most stressful situations without any problems. As seen below, K-9 Behavior Services’ works with the best of the best and with individuals that are some of the hottest and most popular Hollywood celebrities, including one of the highest paid, the famous and the controversial Charlie Sheen! One of Hollywood's hottest celebrities, Charlie Sheen, calls K-9 Behavior Services to Beverly Hills for the dog attack scene of his craziest video! Charlie and crew where nothing but professional and appreciative. Working with Charlie was a blast, and he took the dog bite like a pro! HOLLYWOOD AND BEVERLY HILLS' CELEBRITY DOG TRAINERS! From Hollywood elite's like Ben Affleck, Eddie Murphy, Charlie Sheen, Joel Madden, Nicole Richie, Benji Madden, Cameron Diaz, and more, to Beverly Hills' rich and famous, and Santa Barbara's elite billionaire's, K-9 Behavior Services' Jeremy Talamantes has been a trusted source for celebrity dog training to the rich and famous for over 20 years! JUST HANGING OUT WITH TREVOR ARIZA FROM THE PHOENIX SUNS! When I was contacted by Trevor Ariza, NBA basketball player for the Phoenix Suns, I was really excited. Trevor actually played on the Lakers back in the early 2000's. My son and I used to watch the Lakers play and loved it when Trevor would come in and get things done. It was great doing business with Trevor, and becoming friends with him. EDDIE MURPHY, ONE OF MY FIRST HOLLYWOOD CELEBRITY CLIENTS! Eddie Murphy was one of my first celebrity clients. I worked with many of his children's dogs through the years. All of his kids were always very kind and a pleasure to work with. I spent a lot of time with two of his daughter's dogs, Sparkle & Angel, two cute little Yorkies. A huge thank you to the Murphy family for always being such great people! Joel & Nicole (and the entire staff) were nothing short of awesome! They have always been professional, kind, and most of all... down to earth. It has always been an absolute pleasure to meet with Joel. Nicole, and their family. I am very grateful to them for always being such spectacular and friendly clients. They have also always been very kind in recommending their friends to my dog training services. Hollywood goes to professional celebrity dog trainer, Jeremy Talamantes, for professionalism and success when the cameras are rolling. Jeremy has proven many times that his dog training skills can be counted on when the cameras are rolling and the crowds are cheering. WHEN THE HOLLYWOOD CELEBRITIES COME CALLING! One thing Jeremy Talamantes has been known to be, is an honest and straight forward business man. No matter who it is or where it is, no matter what show he is on or how rich and famous his client is, he always makes sure to be honest and professional. Although some people may not want to hear the truth, Jeremy always tells them the truth. SO MANY CELEBRITY CALLS, SO LITTLE TIME. I was actually called by 'Keeping Up With The Kardashians' to appear on their show, but at that time, I wasn't able to carve out the time. Mistake perhaps? Perhaps, but I was able to have some colleagues and friends shoot the episode. From what I understand, the segment hasn't aired, but I will update this section if it ever does. EVER HEARD OF A BAND CALLED SHINEDOWN? Brent Smith, singer of Shinedown, is actually a really cool and very down to earth guy (Hope I'm not hurting his bad boy rep). Training and boarding his three dogs was always our pleasure. His dogs were always very well behaved, and Brent was always generous with his time and made sure we always had what we needed to keep the dogs comfortable when with us. When TMZ calls, you listen. TMZ called for an interview on TMZ Live regarding Josh Duhamel and Fergie's new dog. Because Jeremy is known as Hollywood's most trusted celebrity dog trainer, TMZ had questions that needed to be answered. As always, Jeremy was very protective of his clients and their privacy in his famous TMZ celebrity dog trainer interview. Celebrity dog trainers to the most rich and famous elites of Hollywood, Beverly Hills, and Los Angeles! Celebrity dog training television appearances for attack dogs, celebrity dog training, Josh Duhamel, Fergie, Charlie Sheen, Eddie Murphy, Ben Affleck, Jennifer Garner, Cameron Diaz, Nicole Richie, and many more! 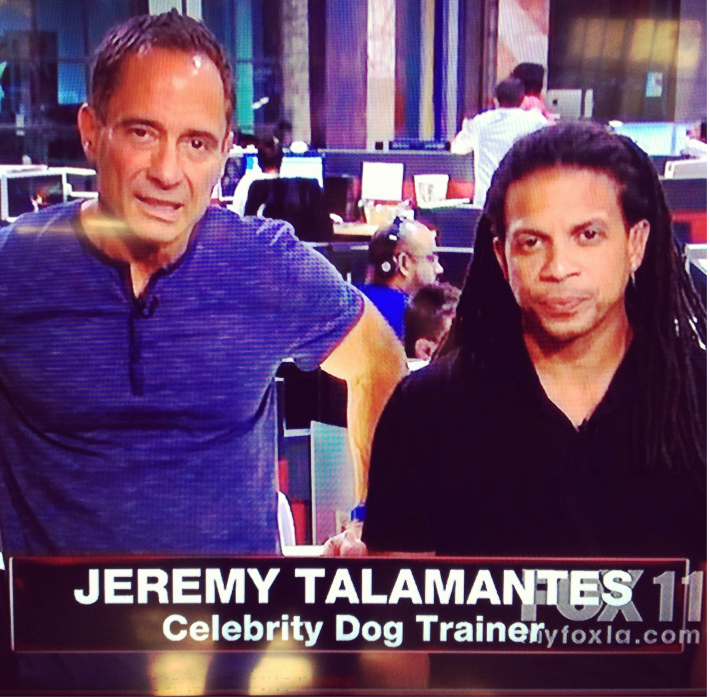 Jeremy Talamantes was contacted by TMZ to appear on the TMZ Live show as the authority on Celebrity Dog Training in Los Angeles! Hollywood knows where to turn when it comes to Celebrity Dog Trainers in Los Angeles, Hollywood, and Beverly Hills. With celebrity dog training clients such as Eddie Murphy, Charlie Sheen, Ben Affleck, Nicole Richie, Cameron Diaz, and more, K-9 Behavior Services’ Jeremy Talamantes is the person to call!​ Jeremy has worked with of Hollywood’s top celebrities to help them get their dogs under control and be able to walk them in public without their dog causing a scene. Jeremy has also provided some of Hollywood’s top famous celebrities with the world’s best highly trained protection dogs.​ Jeremy is always very discreet and professional when it comes to working with H0llywood’s top celebrities. However, no matter who he’s working with, he is always honest and straight forward. Jeremy’s goal is to always help his client and not to candy coat any potential problems. TMZ called Jeremy to discuss Josh Duhamel and Fergie getting a new dog and hiring TV personality Cesar Milan. Contact K-9 Behavior Services today if you want a straight forward and honest evaluation of your dog training situation. Jeremy will take the time to listen to your situation and he will explain to you what is the best way to minimize and manage any issues that you are having. We look forward to hearing from you! We train with Hollywood’s top celebrities all over the US, including Los Angeles, Ventura County, Orange County, Santa Barbara, San Diego, Las Vegas, Sacramento, Long Island, Texas, and more! Feel free to call me and ask any questions you might have regarding celebrity dog training, protection dog and service dog sales. Hollywood Celebrity, Charlie Sheen, Calls On K-9 Behavior Services' Jeremy Talamantes For His Latest Dog Attack Video! When Hollywood celebrities want the best of the best in dog training, attack dogs, dog training, doggy boot camps, and dog aggression training, they call on the best in the business for professionalism, performance and reliability… K-9 Behavior Services’ Jeremy Talamantes and his staff of celebrity dog training professionals. Jeremy Talamantes steps in to assist in choreographing the attack scene with Charlie Sheen and to make sure that all were safe on the set while shooting the attack video. Charlie Sheen wore one of Jeremy’s attack bite suits and took Momo’s punishing grips like a protection dog pro! With some bruising after the attack scene was shot, Charlie Sheen was pumped and excited with such great video footage. Momo was used as the attack dog for Charlie Sheen’s newest video. Momo is a large male Belgian Malinois that Jeremy decoyed to a level II French Ring certification, that can perform at a second’s notice with people, cameras, lighting, and all of the sound and commotion that surrounds a Hollywood taping. We would like to thank Bob Maron, Charlie Sheen, and their crew for the opportunity to work with them and for their courtesy and professionalism. Jeremy Talamantes appears on 'storage wars' as the Hollywood celebrity authority on dog aggression! Jeremy is known as Hollywood’s authority on celebrity dog training and protection dogs for the rich and famous, from rock stars to billionaires, Jeremy has the best reputation amongst Hollywood elites. During the show, one of the many dogs that Jeremy decoyed to high French Ring level competition, shows off his biting skills, while Jeremy is in the protective bite suit. Jeremy goes on to explain the value, or lack thereof, of an old bite suit that Jarred & Brandi had found in a locker they purchased. Jeremy tried to get Jarrod to take a bite in the bite suit, but Jarrod was having no part of it at all. We train and deliver Autism, PTSD, Multiple Sclerosis, Muscular Dystrophy, diabetic alert, seizure alert dogs all over the US, including Los Angeles, Ventura County, Orange County, San Diego, Las Vegas, Sacramento, Long Island, Texas, and more! Feel free to call me and ask any questions you might have regarding service dogs and service dog training. Hollywood Celebrity Dog Trainer, jeremy talamantes of k-9 behavior services, protection dog appearance Capital cities music video for their award winning song 'safe and sound'! “Wikipedia… The first music video for “Safe and Sound” was self-produced and edited by the band and uploaded to their official YouTube account on February 24, 2011. It features alternating historical film clips of dancing and war from the last century generally arranged in chronological order. Jeremy Talamantes, Owner of K-9 Behavior Services, is Hollywood’s go to celebrity protection dog trainer whenever they need reliable protection dogs for TV or film. Jeremy and his protection dogs have made many TV, Video, music, and film appearances, including Charlie Sheen, Storage Wars, The Doctors, Capital Cities, Animal Planet, KCAL 9 News, and more! Jeremy Talamantes appears on 'The Doctors' as the Hollywood authority on dog aggression! KCAL9’s show ‘The Doctors’ goes to K-9 Behavior Services as the authority on dog aggression. Don’t miss this show Thursday, October 28th, at 11am on channel 9 (Los Angeles) regarding what to do if you are confronted by or attacked by an aggressive dog. K-9 Behavior Services puts host, Dr. Travis Stork, in a bite suit and has Malinois, Momo, attack him from across the stage. Don’t miss this exciting episode of ‘The Doctors’! K-9 Behavior Services has the knowledge, experience, and the available dogs to answer the needs of the Hollywood’s most demanding film requirements. From large attack dogs to some of the cutest little fluffy dogs, the company is always ready and willing to meet the demands of Hollywood’s most demanding film requirements. K-9 Behavior Services provides, attack dogs, including German Shepherd Dogs, Belgian Malinois, Dutch Shepherds, Rottweilers, Pit Bulls, and more. Also provided are, Golden Retrievers, Labrador Retrievers, and many other breeds including mixed dogs. If you have any questions on availability feel free to call. Hollywood Celebrity Dog Trainer, jeremy talamantes of k-9 behavior services, films and trains with hollywood celebrity rockmond dunbar! Rockmand and film crew came to Jeremy’s old 1,545 acre ranch in Fillmore, CA to film a new project that he was involved in. 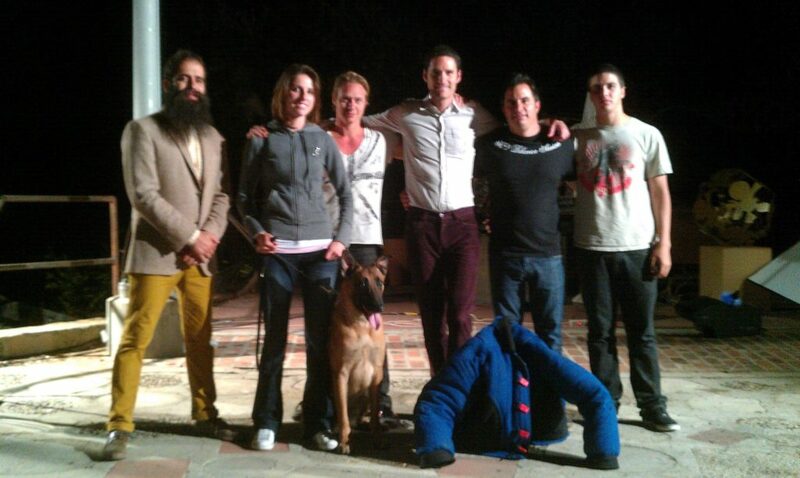 The filming included security scenes where Rockmond used Jeremy’s Malinois, end even some of Jeremy’s staff, to film. Rockmond Dunbar is an actor and producer, known for Kiss Kiss Bang Bang (2005), Sons of Anarchy (2008) and The Family That Preys (2008). Hollywood’s top celebrities like to use K-9 Behavior Services because filming always goes smooth and there are never any problems with the dogs performing what is required of them. When the lights turn on and there are people, music, and many other distractions, Jeremy and his dogs always perform well! Hollywood Celebrity protection Dog Trainer, jeremy talamantes of k-9 behavior services, protection dog appearance on giuliana & bill show! We offer celebrity dog training in Beverly Hills, Hollywood, Bel Air, Los Angeles, Orange County, and Ventura County. Including, celebrity Dog Obedience Training in Studio City, Pasadena, Culver City, Sherman Oaks, Burbank, the West Side, Manhattan Beach, Malibu, Camarillo, Valencia, Stevenson Ranch, Porter Ranch, Simi Valley, Thousand Oaks, Moorpark, Ojai, and surrounding areas. We also have Dog Obedience Training clients in Orange County, including Dog Obedience Training in Irvine, Costa Mesa, Huntington Beach, and surrounding areas.